For the Brownies: Cream butter and sugar together. Add eggs and blend well. Add vanilla, salt, cocoa and flour. Don’t overbeat. Pour into a greased 9X13 pan.Bake at 350 F for 20-25 minutes. Let cool. Melt chocolate chips in microwave for 1 minute and drizzle with a spoon over brownies. Melt caramel bits in microwave for 1 minute and drizzle over chocolate. For the Frosting: Combine egg yolks, sugar, milk, butter, and vanilla in a large saucepan. Cook and stir over medium heat until thickened, about 12 minutes ( Make sure to stir consistently for at least 10 min). Add coconut and pecans. Beat until thick enough to spread. Pour over top of brownies. You may want to place in the refrigerator to harden. 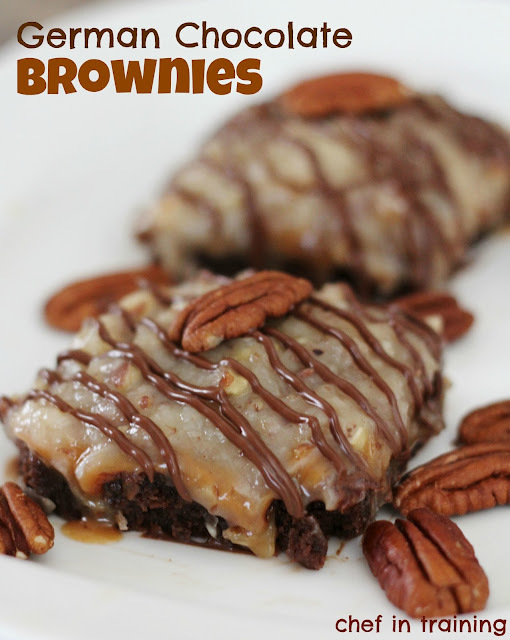 I drizzled some melted chocolate over the brownies and topped with pecans.